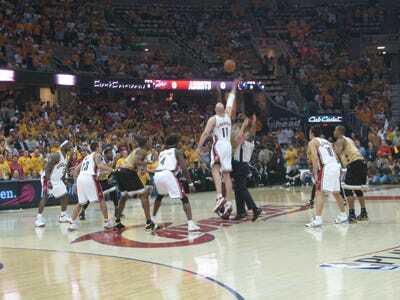 Opening tip of Wizards vs. Cavs, Game 1, Round 1 of the playoffs in 2008, when times were better for both teams. The Washington Wizards defeated the Cleveland Cavaliers yesterday, 115-100, and captured their first victory on the road. Now, the Wizards can reflect on their 1-25 road record as they prepare to battle the Orlando Magic on Wednesday night. The Orlando Magic were in action on Sunday also, and they defeated the Los Angeles Lakers by a margin of 14 at home. The final score of that game was 89-75. Magic star, Dwight Howard, came up big with 31 points and 13 boards. Let’s go ahead and state the obvious: the Orlando Magic will prove to be a more significant challenge to the Wizards than the Cavs, even though the jury is still out as to whether the mult-team trade between the Orlando Magic, Phoenix Suns, and Washington Wizards made the Magic a better team. Let’s face it. Sunday’s Wizards vs. Cavs matchup was one to watch for all the wrong reasons. For the same reason people “rubberneck” at car accidents, people tuned into the Wizards vs. Cavs game. It’s no secret that things have taken a 180-degree turn since LeBron James decided to take his talents to South Beach. The Cavaliers were on a downward spiral and lost a string of 26 games. 20-six games. No, that’s not a typo. The Cavs lost an abysmal 26 games, and were the joke of everyone who had an interest in the NBA and a voice. Finally, the Cavs tasted victory last week, when they defeated Blake Griffin’s Los Angeles Clippers (aka the “Blakers”). The Cavs hadn’t won since December 18. The Onion Sports Network even did a piece about the team. The premise of the humorous piece was to scare kids straight by making them visit a Cleveland Cavaliers practice. Go read it for your enjoyment. I remember when the Cavs vs. Wizards matchups used to mean something. It seems like ages ago that LeBron James’ Cavs were battling Gilbert Arenas’ Wizards for a playoff spot in the East — that was less than five years ago. How the times have changed. Wednesday’s matchup will be intriguing if not to see if/how Gilbert Arenas and Rashard Lewis play against their former squads. Rashard Lewis missed his second straight game with a sore knee on Sunday, and I haven’t heard if he’ll return for Wednesday’s game. Gilbert Arenas, the former poster boy for the Washington Wizards has had his scoring drop 50 per cent since the trade to Orlando. He currently only averages 8.1 points per game, but to be fair, he’s now coming off the bench. The Wizards vs. Magic game won’t be the most exciting NBA game on the Wednesday night schedule, but it will be compelling for many basketball fans as we draw closer to the NBA All-Star break.